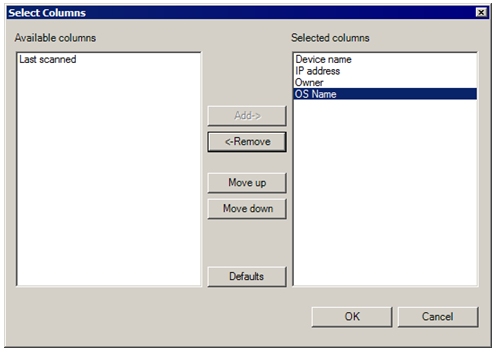 The Column configuration dialog is where you create column sets. Each column represents a single inventory attribute or component that has been scanned into the core database. Columns appear from left to right in the Network View. You can specify the attributes you want to include, when creating or editing a column set. Click Tools > Administration > Column Set Configuration. Select the My column sets object (or the Public column sets object), and then click the Create a new column set toolbar button. 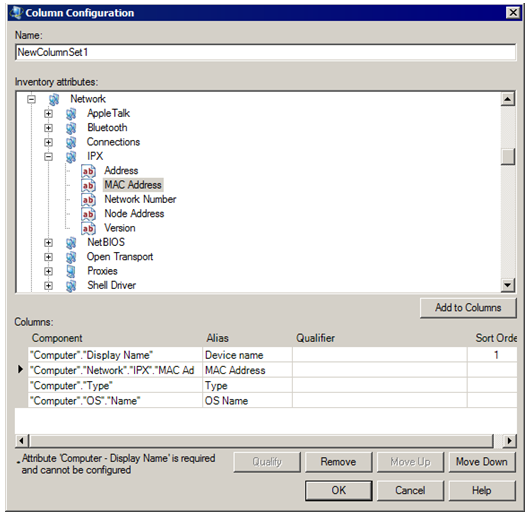 In the Column Configuration dialog, enter a name for the new column set. Select inventory attributes from the list and add them to the Columns list by clicking Add to columns. Remember to select attributes that will help you identify the devices in the device list or returned by the query. (Optional) You can customize how and where the columns appear in the network view by directly editing a component's heading, alias, and sort order fields; or by removing or moving the selected component up or down in the list with the available buttons. (Optional) You can specify more precise qualifying data for software components. Select the software component, click the Qualify button, and then select a primary key value from the list of available values. For more information, see Specify the qualify option with software components. Click OK to save the column set. If after defining certain inventory attributes, you decide you want to hide a column or change its position in the Network View, you can use the shortcut menu to display the Select columns dialog. Right-click any device in the results list of the Network View. Use the Add ->, <-Remove, Move up, or Move down buttons to arrange the columns. You can also return to the original columns display configuration by clicking Defaults.